Hello from Bri Chmel, Realtor® & Owner at Live Love Santa Cruz! Family Cycling Center is one of those bike shops that you walk into that has everything that you could imagine. When you drive past it you will see a plentiful row of beach cruisers lined up down the sidewalk. Located in the Opal Cliffs and Pleasure Point neighborhoods, Family Cycling Center is nestled within the group of shops and restaurants at the end of 41st Ave. Here you can find a buzz of people outside at the East Side Eatery, Verve coffee shop, and the Penny Ice Creamery. You'll also see people biking by with surf boards, headed down to one of the well known surf breaks at the end of the street. This is one of my favorite neighborhoods in Santa Cruz, and it is where I chose to buy my home. Please contact me if you or somebody you know is interested in owning a home in Opal Cliffs or Pleasure Point! John Brown wanted to write his story on his own. I have copied his text directly into this article. Bri: John, you are the founder of Family Cycling Center. When did you move to Santa Cruz and why did you move here? John: I moved from NY to CA three times. The first time I moved from New York was in the fall of 1976. I moved to Santa Barbara and worked in a few of the fancy French service restaurants in Montecito and also bussed tables at the San Ysidro Guest Ranch. It was amazing coming to such a beautiful area. There were beaches, palm trees and I was living right there near the ocean. I stayed for a year and a half the first time, and headed back to NY near the end of 1977. I came back out west again in January of 1980 and stayed for that year. I then moved back to New York again, but grew tired of commuting into Manhattan and Long Island. I came back out for the third time and permanently moved here in the fall of 1984 because I realized that I really missing the Santa Cruz outdoor lifestyle. Bri: What is your history in the bicycle industry, when did you start Family Cycling Center, and why? John: Well, first the "why". Growing up, I was basically a kid who just loved bikes. I always rode my bike everywhere. When I was here in 1980 I restored bikes out of my house as a hobby. I would go to the flea market and garage sales on the weekends and buy anything that I thought I could repair or fix to resell in the trade papers. When I went back to New York at the end of1980 I was working in the auto industry. I missed the hobby of working on bikes, so I started fixing them again on the 6th floor terrace of my apartment. To say the least, it wasn't the same as being here. When I came back out in 1984 I got a job in construction with a friend of mine (Allan) who was living here in Santa Cruz. I did that for a while, but started doing the bike restoration on the side again. The bike business started to keep me busy and I slowly faded away from the other work. To me, working on bikes was always easy and fun, and I loved doing it because it was my passion. I wasn’t making much money on any of these sales, but I would sometimes sell a bike for $75 or $125, which was a decent price for a used 10-speed back then. At the time, I was living in a mobile home on Portola. I bought the trailer in 1985, and used my own home space to repair these bikes. There was a guy named Jack on Brommer Street who had a bike business out of his garage. It was called “Jax Used Bikes”. He was a gruff old guy with full head of white slicked back hair and tattoos on his forearms. He was a little rough around the edges and had a past with owning gas stations. Jack loved fixing and selling cruisers and kids bikes, but didn’t particularly care for 10-speeds. I used to go there almost daily to get bike parts from the piles of bikes he had in his yard, called the "boneyard". He would be cursing trying to fix the 10-speeds, so I would often offer to help him while I was looking for my parts I needed. One day I brought up the fact that I was always over there, and asked him what he thought of moving my business over there as well. Then we could both work in the same place and keep each other company. He agreed, and gave me one of the spare bedrooms in his house to store all of my stuff. John Brown, center, in the early 1990's. 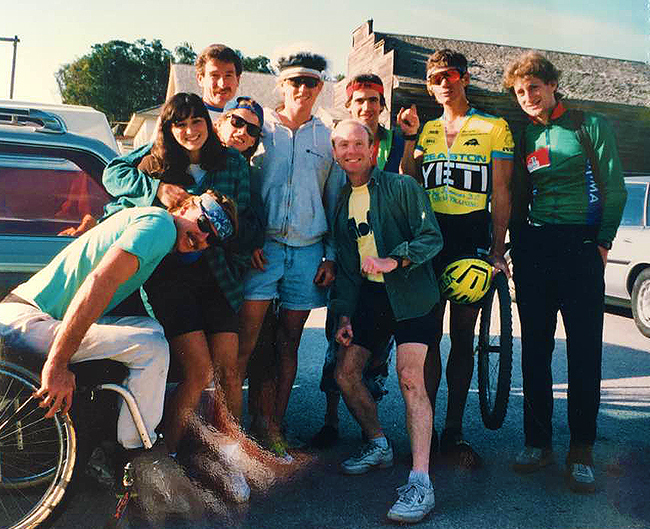 Him and his friends after a cycle cross race up at "Big Creek Lumber sawdust piles" heading to Davenport Cash Store for some breakfast. I had probably ten bikes and a few boxes of parts when I started out, and within a year and a half of us working together seven days a week, ten to twelve hours a day, I had about 75 used 10-speed bikes. I would unload the bedroom and his garage full of bikes every morning onto the front lawn, and we would fix bikes or sit on his front porch and sell bikes and parts. I did that for a year and a half. In 1986 mountain bikes started to become popular. I told Jack that 10-speed sales were really slowing down, and I asked him if I could also start to sell 10-speed parts to supplement my shrinking income. He said no, that it was his business. I explained to him that I needed to make a bit more money or couldn’t afford to work with him at his house anymore. At this point I was also helping Jack build all of his mountain bikes, as he hated working on bikes with gears. The first location of Family Cycling Center on 41st Ave in Capitola, 1988. It was at that point I started looking for a place to rent. I found the little red building on 41st Ave, which is now the home of “Chill Out Café”. There was a for rent sign on the door, and I called every day for two weeks, a few times a day. Nobody would return my phone calls, but it was the only place that I could visualize my bike shop being. It was about the size of a one car garage, and it was perfect! After about two weeks, a man called me (somewhat laughing) and asked if I was the guy that had been calling every day. He said sorry for not calling back, but he had been in Mexico. It turns out that this man was Bill O’Neill, Jack O’Neill’s brother. I went and met him at the shop. He was this tall thin man who towered over me. He told me that he liked the idea of a bike shop being at his place. It was just an empty shack of a building, and when I walked inside I knew it would be just right. Although this part of town is very popular now, it was not then. That year in 1986 I could have walked into the middle of the street with my eyes closed at any time of the day, and not get hit by a car. The surf back then on Pleasure Point was just for the local “surf bros”, and there was hardly any traffic on Portola or 41st Ave. People basically did not come past the railroad tracks. The only shops on the block were a few thrift shops, a few “Bordellos” (hence the name Pleasure Point) and the “Hurry Back In Bar”. It was the local bar with 25-cent beers that had its daily regulars. It was a pretty quiet community at that time. John with his new redwood bike racks that his good friend Allen made for the shop. Early 1990's. I somehow signed a five-year lease with Bill, even though I didn’t have enough money to pay next months rent. I actually signed the lease for more money than I was making a month at Jack’s shop. I told myself that I was going to make it work, that I didn’t have a choice. I called my cousin in New York and borrowed $1,000 from him to pay for the second months rent. It turns out that I was so busy from the day that I opened the store that I had to temporarily close it down a week later so I could finish fixing it up. My friend Allan who I worked for in the construction trade was a tremendous help with building redwood racks and shelves, and fixing the walls. He made the place look great! I opened back up a couple weeks later, and it basically took off. I was making more money than I ever had at Jack's shop, and I could now sell everything bike related. I was on my way! When I opened up the store I had 600 square feet of room in the red building. My idea was that I wanted to be a one-person operation for as long as possible. I just wanted to keep myself busy and have enough money to eat and pay rent. I didn’t think much about trying to grow the business to a larger size. But six years later in 1992 I was up to 5 helpers already, and was starting to outgrow the space. A man name Bill Humphrey, who always walked by the shop on his way to lunch at Canton Restaurant, stopped in one day. He was another very tall Bill, about 6’ 6”. He told me to take a walk with him. He put his arm on my shoulder and walked me up the street, unlocking the door to a pretty large space (where Surftech currently is). He told me he wanted to show me something inside. I walked in and told him there was nothing in there, I didn’t understand. He asked me what I thought of the place, and I still wasn’t catching on to what he was getting at. He then asked me if I would consider moving into this location, and I was startled. The room was around 6,000 square feet, and I told him that I couldn’t afford it. He continued on to offer me an incredible deal that I couldn’t turn down, which would bring me from 600 square feet up to 3,000 square feet (he divided the space in half). A month later the staff and I literally walked everything up the street to our new location with dollies and wagons. I had lucky break and it was a really exciting time in life. Bill liked what I was doing and he wanted to see us grow. And grow we did. Within the year I asked Bill if we could take down the wall and take back the other 3000 square feet, and we did. Shortly after we also rented the 2500 square foot warehouse that was behind the back wall. Now we have grown to a shop with plus or minus15 employees. Bri: At that point in town, how many bike shops were there in Santa Cruz? John: There were actually quite a few shops. I believe there were about fifteen in town. There was a bike shop around the corner on Portola and 41st, called Dutchman Bicycle shop, where Paradise Surf Shop used to be. Everybody that I knew at the time told me that I was crazy to open up a shop around the corner from one that had been there for 25 years. They told me that I wouldn’t make it, and asked me why I was doing it. I didn’t really know what to say, but I just told them that I wanted to do my own thing. I look back now, and it was purely naive enthusiasm. The Dutchman Bicycle shop basically sold only brand new bikes. I wanted to continue to do my used bike shop. Bri: How did you come up with the name Family Cycling Center? John: I wrote a list of ten names that I could think of and liked. Family Cycling Center was the very first thing that came to my mind. I wanted to open up a shop that was un-intimidating to people, and I wanted it to be very inviting. I figured there was nothing better than calling it Family Cycling Center, because it was for everyone. I started doing used stuff mainly, but that rapidly changed. People started asking me if I could get mountain bikes in. I started ordering brand new cruisers and kids bikes at first because I literally didn't have the money to buy brand new mountain bikes . It just continued to get busier and busier from there, especially as I started getting in well known bike brands such as Raleigh and Schwinn. Bri: What do you think made Family Cycling Center a success? John: I think it was mainly the friendly atmosphere. Many people would tell me about their experiences at other shops, and how they got talked down to because they didn’t look like an experienced biker or “roadie”. I was happy to talk to everyone and sell people what they wanted or needed. I tell people it’s a simple formula. Be friendly, be informative, and listen to what people’s needs are. So many people bring other things to their job, and talk down to customers. I have never wanted to be like that, and I insist that my employees have the same positive friendly attitude. Even if you’re a serious cyclist and win all of your races, it doesn’t matter. The person walking in the door doesn’t need to hear you talking about yourself, they may just need a new casual style bike, a helmet, some tires or some tubes! The down to earth and friendly atmosphere of the store are what has made Family Cycling Center a success. Bri: What interesting community events or activities are you involved in as a business? John: One of the things that we are very proud of and have been consistent with is being the title sponsor for the CCCX race series since 1997. It is out of Monterey with Keith Defibre and Rod Hernandez. They keep everyone racing pretty much all year with Cyclo Cross, mountain bike races, road races and downhill mountain bike races. Their format is for the whole family- starting with the kid categories, masters, and then the Elite/Pros. We also sponsor "Bike To Work Week", trail maintenance work days with MBOSC (Mountain Bikers of Santa Cruz), the Woodies on the Wharf car show, Junior Guards, and many of the local surf competitions every year. We contribute quite often to the raffles for crisis centers, the Homeless Garden, and school fundraisers. At these we will give away a beach cruiser or some products. There are so many it is hard to count. We get close to 600 requests a year for donations and sponsorship, and this is just a short list of some of the things we get involved in. We have supported a good number of local athletes, some of them being nationally and internationally ranked . Bri: What are your favorite places in town to both road bike and mountain bike? John: For mountain biking my main go-to because of proximity is Nisine Marks and UCSC. I also love Demonstration Forest and Wilder Ranch. For road biking I usually ride south county, through the hills around Corralitos and Aromas. I don't head up Highway 1 north very often but there are great roads up there as well. Bri: Obviously you have been a very successful entrepreneur in Santa Cruz. What do you think the top three traits you possess that have given you your success? 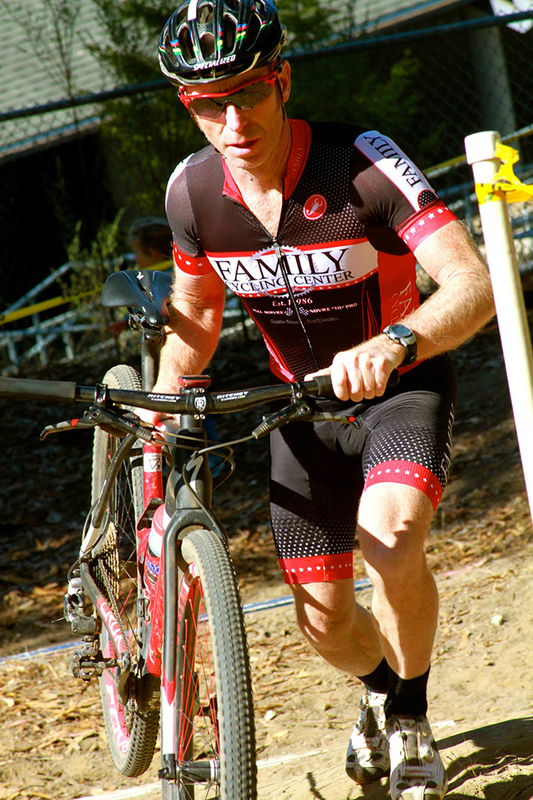 John: When I started Family Cycling Center I told myself that there wasn’t an option to fail. Because this was so engraved in my mind, I wanted to do anything possible to create a loyal following. My mission statement revolved around being friendly, inviting people into my business, being informative, and having the inventory that people wanted to buy. A lot of businesses wont commit to inventory because they try to run lean, and really focus on exactly what inventory is returning a profit. I understand that, but it was never my focus. We hear people from all around the nation, and even the world, come in and tell us that our shop has some of the best variety in product they have ever seen. This is a huge compliment. A lot of shops become too single branded with the products that they carry. With as much pressure I get from my vendors to only carry them and narrow down, I try not to do that. I feel like I have more of a problem over buying than under buying. I would rather have the selection so that customers find what they need and are happy. I basically just buy what sells, and that works. If it sells we buy more, and if it doesn’t sell we put it on sale and don’t buy it again. I am not one of those business owners that sits in front of the computer and analyzes his business and it's numbers. I run my business more by passion than statistics. I also tell my employees that although I may be the boss and they work for me, I also work for them and the shop just like they do. When I need something done it isn’t a demand, I just ask that they get to it when they can. We don’t have sales quotas, and we have had same general manager for 17 years. Most of my employees stay for years, and the ones in college come back in the summer and holidays. Bri: What has this business brought into your life? John: I opened up my business at the age of 30. I didn’t know what my place was in the community yet, and I was also figuring out my own path. I stumbled into what I did by following a passion, which was a hobby, and then a business. Doing what I did saved me in a way because it gave me a direction in life. "If you find what you love and you do that for work, it is never really work". Sometimes you don’t realize what part you play in a community. I was always just here doing my thing. The things that have caught me off guard and have made me feel really humbled is when somebody comes in and tells me that what I have been doing all these years has helped save their life. For example, some of the rough guys from the area have come in over the years and told me how mountain biking has saved their life. It allowed them to get rid of a ton of aggression and stay out of trouble. I have met many people who have struggled with addictions and have found the sport of cycling. I have seen generations of families come through the shop. I feel like I have been a part of people’s lives in this community. Money was never the focus of this business other than making sure I could pay the bills and payroll. My employees come first. Bri: What is on your horizon for the future? Was building one business enough, or do you have any future ventures up your sleeve? John: I have been in business for almost 31 years now. I have started to think about an exit strategy because I sometimes wonder what this next phase of my life will encompass. Sometimes I think about opening up a different type of business. I have had a handful of people over the years approach me to sell. If I do,I would like to sell it to the right person so that it gets a good home. It would feel good to see it continue to run well. I feel like it is my baby, and I wouldn’t want to see somebody take it over because making money is their only focus. I would hate to see somebody to disassemble everything that I have done for the last 31 years. Part of me might enjoy becoming that adventurous young person again. I would love to go travel the world, relax, and take in the sights. It is all up for grabs right now. I don’t have freedom quite yet, but I have options for freedom in the future. At the end of this interview at Coffeetopia, two guys pulled up on their road bikes. They high-fived John and told him what an amazing day it was out there and about how amped they were on their bikes. I could see John’s face light up, knowing that his business was a contributing factor to what gives people happiness in our community.